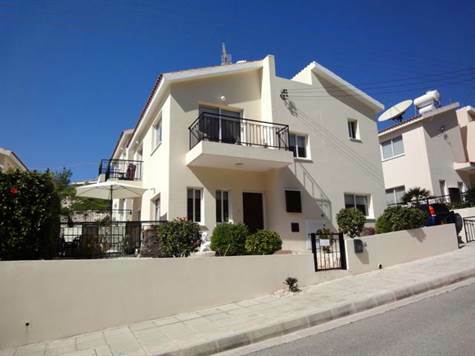 Tala, Paphos - This beautifully presented 3 bedroom detached villa is situated on a small quiet complex of 8 villas in the popular village of Tala. The ground floor features a spacious living room with wood burner fire and patio doors on either side leading on to outdoor terraces. The separate kitchen/dining room is well equipped with built-in oven, gas hob, extractor fan, fridge/freezer, dishwasher, washing machine and dryer and also has patio doors providing easy access to the outside areas. Central to the living accommodation is a marble staircase with guest cloakroom off to the side. Upstairs are 3 good size double bedrooms, all with fitted wardrobes, patio windows and a balcony. The master bedroom has an en-suite shower room and the family bathroom is accessed directly from the large landing. This lovely property is in excellent condition and has been well maintained by the current owners. It is suitable both as a holiday home and for permanent living. In addition to the wood burner fire in the lounge, there are radiators throughout the property. The property is being sold fully furnished and has title deeds.